Have you ever wondered why and how Laxmidevi resides in cow dung? Why cows are considered as the most significant of all animals? How come cows have varied horns? How were cows created? How cows got their position in Goloka? Do you know the story why little Krishna in Gokula never wore footwear? Do you know about how Lord Shiva made the Bull as his vehicle? 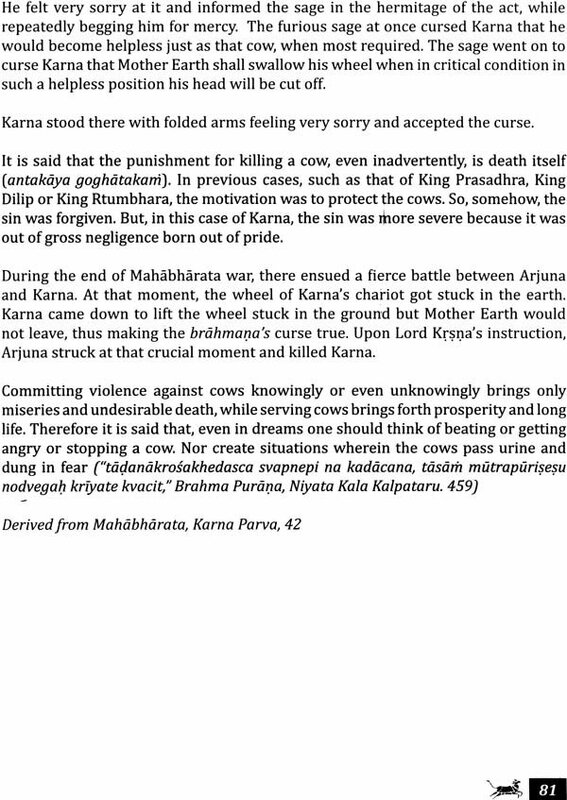 Is cow killing prescribed in Vedas? Find out about all this and much more! Cow care and cow protection remains crucial to the survival for humanity. 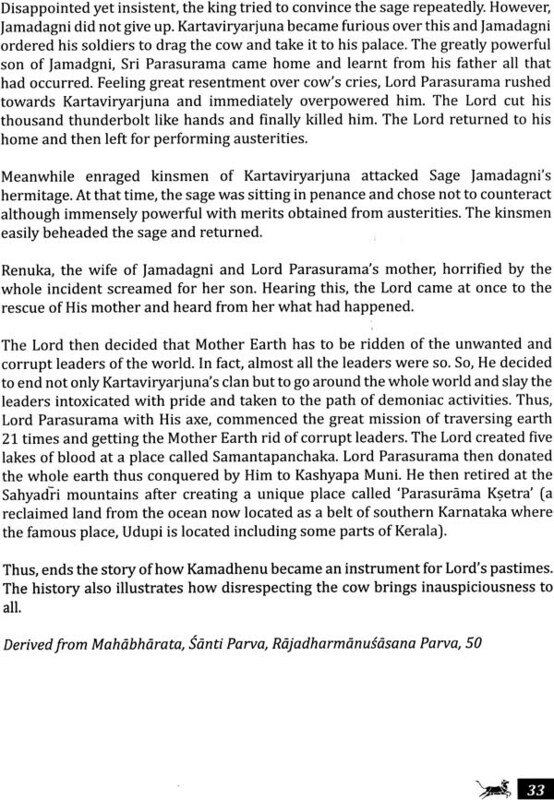 This books is an important addition in glorifying Mother Cow. Cow or dhenu is one of the seven mothers for a human being as described by Chanakya Pandit. Therefore, she is known as Gomata or Mother Cow. The word dhenu comes from the root dhet, which means, 'a cow with a suckling calf' as seen in many paintings of Lord Krsna. A cow is known as 'Gau' in Sanskrit language. In fact, the word 'cow' seems to have originated from the word 'Gau'. 'Gau' is word which is both masculine and feminine. Therefore, whenever 'Gau' or the word 'cow' is used in general, it is to be understood that it refers to cows, bulls and bullocks (castrated bulls for draft purposes). A whole book can be written about just this word 'Gau' and how deep its meaning is and still the glories of this word 'Gau' cannot be possibly explained to its fullest extent. To just give a glimpse, the word 'Gau' refers to a special ray emanating from the Sun globe which can be only absorbed by cow and earth. In fact, Mother Earth is also considered to represent the form of a cow as described in scriptures. Mother Earth provides grains known as krsyanna (that which is produced by agriculture) for subsistence. While Mother Cow provides dughdanna (milk and its by-products). Cows, earth and the sun rays, all three of them provide for protection and prosperity of living beings (prapya pustya lokasamraksanena gavastulyah suryapadaih prthivyam). The word 'Gau' also refers to Vedas (gumukhe casrita vedah, gosu vedah samutkirnay. Vedas help us understand and serve the Supreme Personality of Godhead while Mother Cow helps us understand the Vedas. The word 'Gau' also refers to Goddess Sarasvati who is vagdevi, or one who bestows power of speech and knowledge (atha vagvai sarparajni). Serving cow as well as consuming milk products ignites righteous knowledge and intelligence. As mentioned before, this is just a glimpse about the glories of 'Gau' Much more can be described. That is why it is said, "gunaikadesavacanam parayanam na tu", meaning, "it is not possible to describe the glories of Mother Cow. Whatever glories have been described is to be understood as just a fraction only (Mahabharata, Anusasana Parva, 51.21). One of the most important foundations of the Daiva varnasrama culture or Sanatana dharma culture is agriculture and cow protection. Therefore, it is declared that first of all cow protection has to be achieved. Agriculture and cow protection are prescribed as a common duty for all the varnas and they are not prohibited for anyone. In other words, cow protection is the basis of a civilized society upon which foodproduction stands and in turn the whole economy is working. Therefore, just like Lord Krsna, cow is the center of a civilized society. Lord Krsna has said - 'dhenunam asmi kamadhuk' (Srimad Bhagavad-Gita, 10.18) which means, "Out of cows, I am Kamadhenu" The word 'Kamadhenu' means - 'wish fulfilling cow'. Lord Krsna has sent forth Mother Cow and her progeny to fulfill the needs of not only the human society but all animals and plants of this material world. Therefore, He is known as 'go-brahmana-hitayo', meaning 'eternal well-wisher of cows and of brahmanas because they both essentially belong to the same family, but have two different bodies ('brahmanascaiva gavasca kulamekam dvidha sthitam" - Gomati vidya, Visnu Dharmottara Purana). Without cows and her progeny, yajnas, or prescribed duties performed as an offering to the Supreme Lord, as well as the fire sacrifices or agnihotra yajnas, both, are not possible. Without performance of such yajnas, those living in this conditioned life of materialism cannot be elevated to higher consciousness and this is not possible without the blessings of cow and progeny in the form of their pure products and bull power. Hence, the Supreme Lord creates both these sacred yajnas, as well as the ingredients to perform the yajnas. This, the Lord states, "saha-yajnah praja srstva purovaca prajapatih" (Srimad Bhagavad-gita, 2.10). Serving cows can rid one of all sins. 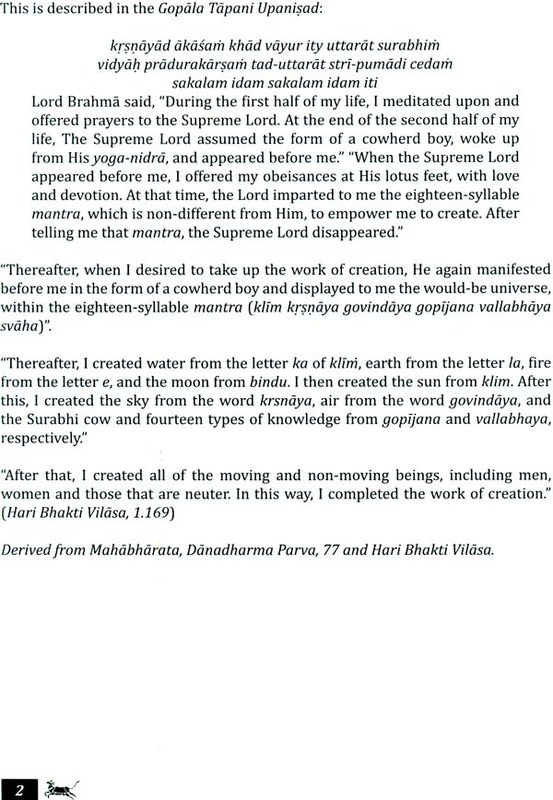 Therefore, Srila Rupa Goswami has instructed it as one of the most basic and necessary steps in sadhana bhakti ("asvattha-tulasi-dhatri-go-bhumisura-vaisnavah, pujitah pranatah dhyatah ksapayanti nrnam agham", Skanda Purana quoted in Bhakti Rasamrta Sindhu, 2.110). Hence, to lead a meaningful life, we ought to understand the importance of sacred cow. How do we understand the importance of sacred cow? The answer is that we have to understand this from the standard books of knowledge, which are Vedas Vedic scriptures, especially Puranas or history, have accounts of various incidents that teach us the importance of cow. The attempt of this book is to present these timeless stories attractively through illustrations so that ultimately we are all drawn to understand the message inherent in these pastimes. "Men with a poor fund of knowledge only accept the history of the world from the time of Buddha, or since 600 B.c., and prior to this period all histories mentioned in the scriptures are calculated by them to be only imaginary stories. That is not a fact. All the stories mentioned in the Puranas and Mahabharata, etc., are actual histories, not only of this planet but also of millions of other planets within the universe. Sometimes the history of planets beyond this world appear(s) to such men to be unbelievable. But they do not know that different planets are not equal in all respects and that therefore some of the historical facts derived from other planets do not correspond with the experience of this planet. Considering the different situation of different planets and also time and circumstances, there is nothing wonderful in the stories of the Puranas, nor are they imaginary. We should always remember the maxim that one man's food is another man's poison. We should not, therefore, reject the stories and histories of the Puranas as imaginary. 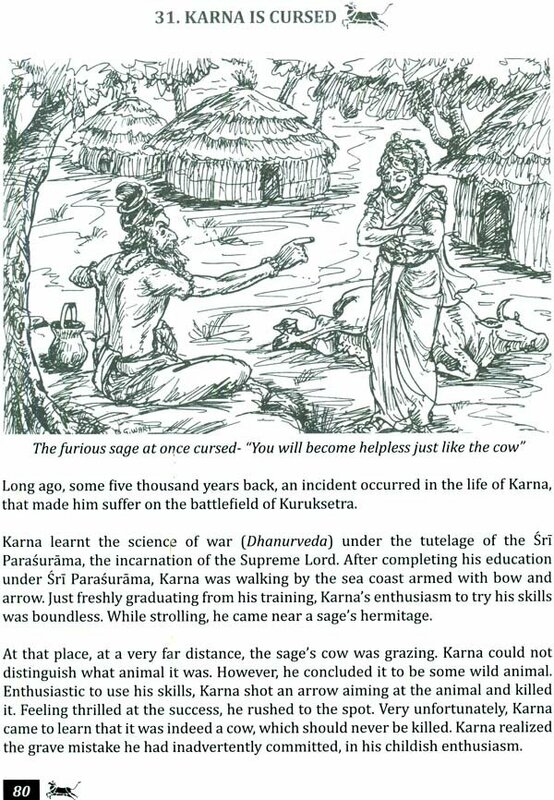 The great sages like Vyasa had no business putting some imaginary stories in their literatures. Therefore it is recommended to read these incidents from Puranas at night before going to bed (nisi dipah satantriko divya pauraniki katha, evam krte ratnapurruam mahim dattvta bhavetphalam, Niyatakala kalpataru, 469). Engaging one's mind in reading and meditating upon these wonderful and timeless stories is itself called austerity of the mind. It is a great way to teach the importance of cows to young or old. These stories are an easy way to communicate through speeches, dramas or fine art. "To make the mind austere is to detach it from sense gratification. It should be so trained that it can be always thinking of doing good for others. The best training for the mind is gravity in thought. One should not deviate from Krsna consciousness and must always avoid sense gratification. To purify one's nature is to become Krsna conscious. Satisfaction of the mind can be obtained only by taking the mind away from thoughts of sense enjoyment. The more we think of sense enjoyment, the more the mind becomes dissatisfied. In the present age we unnecessarily engage the mind in so many different ways for sense gratification, and so there is no possibility of the mind's becoming satisfied. The best course is to divert the mind to the Vedic literature, which is full of satisfying stories, as in the Puranas and the Mahabharata. One can take advantage of this knowledge and thus become purified." These timeless teachings are woven through various stories presented here. The remedy in this dark age of faults (Kali-yuga) is congregational chanting of Hare Krsna maha mantra (Hare Krsna Hare Krsna, Krsna Krsna Hare Hare/ Hare Rama Hare Rama, Rama Rama Hare Hare). This mantra will not only raise us from the clutches of materialism and miseries associated with it, but it will also bring raise us to pure state of God consciousness or Krsna consciousness. Cows cannot be separated from the pastimes of Sri Krsna and Balarama. These stories strengthen our conviction in the divine design of the Lord. They are indeed satisfying and can be read again and again. These timeless stories shall also help us to derive essential principles, practices and philosophy of cow protection. Probably, this is the need of the hour when cow protection is severely violated due to lack of knowledge about importance of cows. As the saying goes, gavamesa dharma anyatha viplavah (Apararkah, 3.38) only through cow protection is dharma or righteous duties possible to be carried out, else, without cow protection, there will be great turbulence. Various appendices are also added at the end of the book. Let glories of Mother Cow and Lord Krsna spread throughout the world ("tasam kirtanadeva narah papadvimucyate", Just by glorifying and spreading the message of sacredness of cow is purifying, Visnu Dharmottara Purana, 2.42.27). Let the sacredness of cow be re-established in our society. Let the degradation towards a slaughterhouse civilization be checked! Krsne matir astu !